EDWARDSVILLE — With restoration complete, the U.S. Navy A7E Corsair on display at the Robert C. Stille Edwardsville Township Community Park, 6368 Center Grove Road, will be raised back to its display pylon by Keller Construction at noon today. In October 2016, Edwardsville Township approved a contract with the Flight Deck Veterans Group, a nationwide nonprofit organization based in Tennessee, for the restoration of the historic aircraft. The group restores aircraft as a part of its mission of veterans serving veterans and to pass on the history and legacy of flight deck operations. In May 2017, the aircraft was lowered from the pylon by Keller Construction workers and restoration work began. Flight Deck Veterans Group volunteers completed required maintenance on the aircraft, including cleaning, sanding, and replacing aluminum panels. In July, the township received approval from the National Naval Aviation Museum to place Admiral Timothy J. Keating on the rail of the aircraft. Keating served as commander of Carrier Group Five, the U.S. 5th Fleet, the U.S. Northern Command and NORAD, and the U.S. Pacific Command. He retired in 2009 after more than 38 years of service and was the first Navy officer to head the U.S. Northern Command. 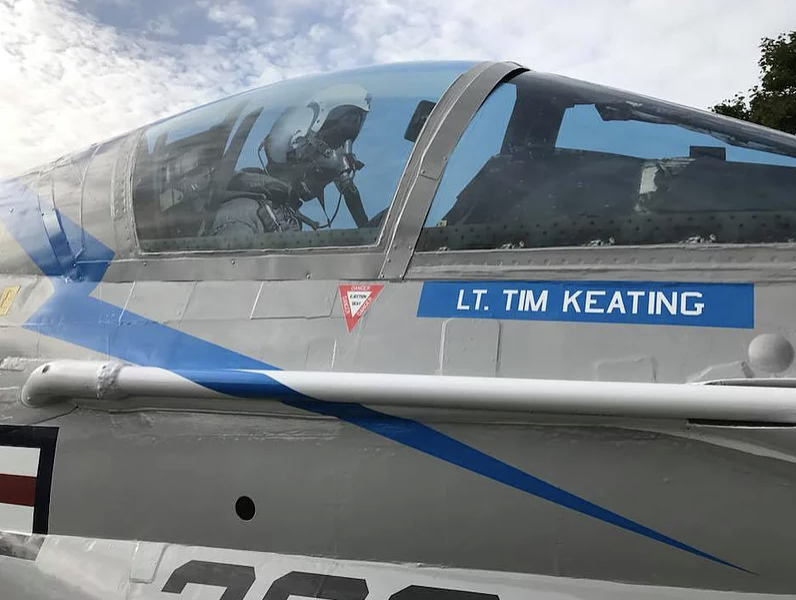 Most significant to the project, Keating was an A7 pilot with the VA-82, the Marauders, on the USS Nimitz in 1975 — the same squadron the township’s aircraft was assigned to. Final restoration work was completed by the Flight Deck Veterans Group earlier this week. After establishing a community fund with the Edwardsville Community Foundation, the township launched Mission: Preservation, The Campaign to Restore the Plane, a three-tiered approach to raising the funds necessary to restore the aircraft to display-ready condition, as defined by the U.S. Naval Aviation Museum, from whom the aircraft is on loan from. The Flight Deck Veterans Group has restored historic aircraft across the country, including an F-14 Tomcat on display on the historic USS Yorktown in Charleston, S.C., and the Fast Eagle 102, the first F-14 Tomcat to shoot down another aircraft in combat, on display at the Commemorative Air Force’s High Sky Wing in Midland, Texas.